We have three ponds on the property. Please visit our Rules and Regulations for more detailed information regarding fishing and boating practices. 1. At the clubhouse, on both sides of Rt 119, is the Lathe Mill Pond also known as the "Fly pond". This pond is stocked for our annual Members and Kids Derby's, typically in May. Please visit our Events Calenar for exact derby dates each year. 2. The Middle Pond, or Saw Mill Pond, is located west of the clubhouse beyond the chain gate. 3. 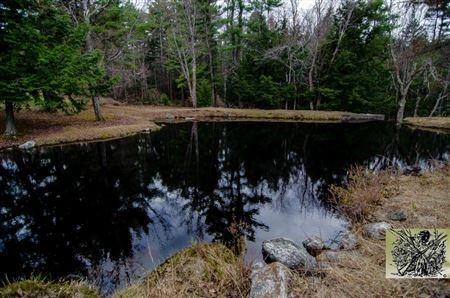 The Swallow Hill Pond, or Wallace Pond, is our largest pond. It is located on both sides of Rt 119 just east of the New Hampshire state line. Swallow Hill Pod totals approximately 52 acres,with roughly 44 acres located on the south side of Rt 119, and the remaining 8 acres on the north side of Rt 119. Small boats and motors are permitted, with access to the boat ramp through our locked gate. Sport Fishing consists of bass, perch, and chain pickerel. This is also the location of our annual Ice Fishing Derby.